Del was born in a small lesser know village in the north part of the Verduran forest near the Sellen River. Her mother, Jaelena had met a revolutionary from Galt named Dignus while she was on a trip to Woodsedge, and the two had an encounter. Jaelena went back home but was (to Del's knowledge) never able to write back to him to tell him he had a child. Del was looked down upon in her village, as they were rather isolated and Del's mother did not have a partner. It was often said that Del had her mother's features except for her father's blue eyes and tongue. She's always been bold and stubborn, even as a child. Del always held on to a special crystal rock her mother gave her. Jaelana said it was from her father and she believed it made Del lucky. One of the other kids, the Elder's son, tried to take her lucky crystal away. They found Del trying to comfort his crying from his burned hand after she burned him trying to get the rock back, so she wasn't the most popular back home. In the dead of night, a Cheliaxian man snuck into town to the Elder's house. He awoke the Elder with a knife to his wife's throat. "You give us 5 children or we take the whole village." The Elder could not help but agree, and the next day sent for the then nine year old Del and four of the other kids (which all happened to either be kids that his son didn't like or kids that could threaten his son's chances of leadership) in the village and the Cheliaxian men stormed in and took the children away. Del endured three years of beatings and slavery at the hands of the slavers, a lot of it spent in the Inner Sea. When she was 12, she was put in her last market as a 'child' slave where she was noticed by Jax Duskroot, an Arcane Trickster who worked for the Starstone Brewers. She stood out to him immediately, as if it were a sign from Cayden himself, and he purchased her from them to save her from the 'special' slave markets. He taught her the ways of Cayden Cailean, and helped her realize her potential not only as a sorcerer, but as a thief. He had her 'lucky crystal' embedded into a tankard and she still keeps it to this day. They made their way across Chelliax to Kintago when she was 14 to take a boat over to Magnimar. In Magnimar they were catching another boat to Sandpoint and then heading on to Kaer Maga to a special orphanage for children touched by Cayden's blessing. Jax gave Del enough gold to get across to Sandpoint in case they got separated as he had some special business to attend to. The next morning came and went and Del did not meet back up with Jax. She crossed over to Sandpoint and waited on the docks for the rest of the day, then the night, and then the day came again and she had not seen him. She waited longer and grew hungrier, until she finally decided to steal herself some food. She was trying to pick a lock to go steal some food when she heard a boy from behind her "You're going to get us both caught like that." Cray huffed and grabbed her arm and pulled her into the dark outside the house as the owner opened the door and peered out. After the owner was inside and the door re-locked Cray looked at the obviously dirty and hungry girl and shook his head. "Why aren't you at the orphanage?" Del looked at him warily and retorted "Why aren't *you* at the orphanage?" Cray laughed and started walking. "C'mon, there's food this way." he said as he lead her to the farm house. She walked in and saw the two other girls there, Becca and Lyndiria, and decided she felt safe enough to stay. She saw the 'food' Cray had and shook her head, taking into the kitchen to do what little she could to make it better. Over the coming days and weeks Del repeated what Jax had told her. "Wait for me if we get separated, find a prominent halfling, find a place for yourself to blend in." She went to the biggest tavern to ask if anyone had seen Jax and met Breanna, an elderly halfling who worked for Ameiko. Breanna enjoyed having someone else to speak her native tongue with and having someone to help with small tasks. Ameiko eventually let Del work in the kitchens in exchange for a meal for the night, and once she realized that Del was taking the food to her friends, she started making sure that there was always just a bit more extra for Del to take home, and didn't scold her for eating on the job. Del has built up a shell of bravery in the face of fear because that is what Jax has taught her to do. She worships Cayden Cailean fiercely and tries her best to live up to his image when she can. She'll taunt and boast to her dying breath, and has done so already in the time the other kids have known her. She wishes Cray would let her help him when he goes out to steal things, because she knows what he's doing and doesn't want him to keep risking himself alone. She is afraid of ghosts because one of the slavers used to scare the kids with ghost stories and illusions to keep them in line. She often wonders who her parents are, but she knows nothing about them and barely remembers her mother's face. After being captured by Tomas, Del dropped into a depression. She tried to escape almost immediately but her knife was turned against her, scarring her chest. Without her crystal in her tankard and unable to cast magic, she fell into a depression as her captors toured her around, trying to find a buyer. They shipped up through Riddleport, and on to Magnimar. She thought of Becca and Zamir and hoped desperately that they got back to Zamir's family, maybe they'd take in Becca. She thought about Aubergine and Lydiria, probably scared and alone. She thought about Cray, who likely escaped already and was doing his own worrying, or maybe moving on to the next group of people who needed his help. On the ship on the way to Korvosa, Del finally snapped out of her depression and, once in Korvosa, made an escape. She flirted with a guard and when he got close to her she cut his throat, leaving into the night and not even making sure he was dead. She worked kitchens around Korvosa until she could steal or buy enough to travel north to the Yondabakari River and on a barge to Kaer Maga. Once there she sought out the orphanage she was supposed to have gone to in the first place with Jax, hoping for some kind of stability in her life again. Once she entered she felt a strange twinge in her head, and walked past the front desk and made her way to a back room. Running after her, a guard saw her investigating a false wall. The Starstone Brewers were called and she was allowed into the basement where there was kept an old blade said to have been wielded by Cayden himself. She gravitated towards it instantly, and laid a hand upon it and felt a rush she hadn't felt in a while. Magic, and maybe…a slight buzz? She crackled with energy as Cayden's presence washed over the room, and left everyone with a smile and the smell of good ale. Del tilted her head and the woman running the orphanage known simply as Miss E laughed. "Summon your blade girl, Cayden has chosen you, just as Jax told you." 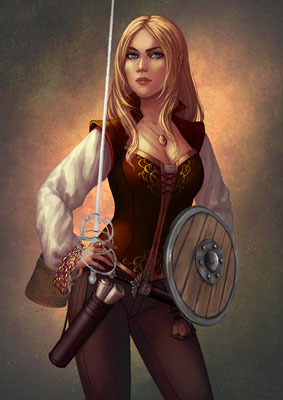 Del wrinkled her nose and held out her hand, in which a brand new rapier appeared. She dropped it out of shock but quickly picked it back up, examining it's features. Silver and ornate, she looked out of place holding it she thought. After some training with the Starstone Brewers on how to use her powers, it was suggested she take a new last name of Cailean, as most children from his orphanages do. She instead chose to take the name Ta'Lamisa, which translates to "Twice a Slave" though the Elvish word Lamisa is used by slaves to refer to other slaves, putting herself on equal footing and not above them. After this name change, she decided to head out on a pilgrimage while the Brewers in Kaer Maga kept an ear out for news of her friends. She went north to Mendev to help out in the fights they have with the devils. Though she did not do much fighting there, she provided moral support many areas through her cooking and willingness to take care of much smaller problems, leaving the more skilled adventurers to handle the devils and demons from the Worldwound. After a year or so there she traveled onward to Mivon to where Cayden's Feast Hall would appear from time to time. It did not appear for her but she enjoyed being in its presence. After some time there she made her way to Iadara, in Kyonin. She wanted to see how elves lived in their elven city in the woods, and hoped she'd be recognized and taken to her mother. No such luck was had there and eventually she grew tired of the looks the pure blooded elves were giving her and she left. She made her way back to Kaer Maga to study more and help out taking care of the kids by running an outreach program to the youth who refused to come to the orphanage, much like she did as a child in Sandpoint. She used to check very often for news of her friends, but there was nothing but memories. Sometimes she'd find herself humming a song that Aubergine would play for them, or wondering what Becca would think of an art piece, or trying to guess how many coins were in a bag like Zamir was always able to do. Sometimes a kid would play a prank and she'd think of Rek, or hear Lyndiria's voice behind a sarcastic comment someone else made. She'd think she saw Cray sometimes in the corner of her vision, or ducking around a corner, but he was never there. She wondered and wondered until she got the invite from the Pathfinder Society. If nothing else, there might be work for a Brewer out there at the very least, but she felt some hope deep down in her soul that she might see her friends again. Del took a big drink of her ale with the Lucky Drunk smiling on her and headed into the unknown.